I thought this was interesting - in an interview with Laura Ingraham on her radio talk show, Palin made some interesting comments in response to recent comments made by former First Lady Barbara Bush, in which Bush stated she hoped Palin would remain up north. "I sat next to her once, thought she was beautiful, and I think she's very happy in Alaska," Bush said, "and I hope she'll stay there." Palin's response: "I think the majority of Americans don't want to put up with the blue bloods -- and I say it with all due respect because I love the Bushes -- but the blue bloods who want to pick and choose their winners instead of allowing competition to pick and choose the winners." Sarah Palin backed right-wing candidate Joe Miller for Alaska's senate race over Republican incumbent Lisa Murkowski. While Miller beat out Murkowski in the Republican primaries, Murkowski was victorious as a write-in candidate, beating Miller and the Democratic contender in the general election. Miller, being the sore loser that he is, filed a lawsuit with federal courts, and then state courts, in order to block Murkowski from being validated so he can contest the election results and try to dig up some more votes for him (as well as throw out more Murkowski votes). 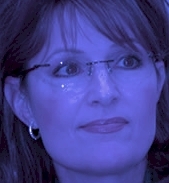 Palin through her political action committee, SarahPAC, contributed money for Miller's recount battle. 1) "Blue bloods" technically are members of royalty, or the aristocracy. One can hardly call "establishment Republican" representatives of corporate America "blue bloods". The more correct term for the Bushes and others like them is corporatists. Even the Kennedys are corporatists, albeit a bit more inclined toward philanthropy than most other established families. 2) George H.W. Bush was head of the CIA before he became president. Does Sarah Palin REALLY think (or not think, apparently) that it's a good idea to insult someone who used to wield the kind of power H.W. did? Isn't it obvious our current president holds him in some esteem? Oh, that's the problem. Sarah Palin has been stalking and attacking President Obama for all of the past 2 years 2 months, and she attacks anyone whom the President respects, admires, and rewards (H.W. is going to be awarded the Presidential Medal of Freedom).